It’s almost Halloween. I’m dressed in black from head to toe as instructed and standing in line to buy my entrance ticket to the museum in order to participate in a Treasure Hunt at the Louvre by THATLou. “Hi”, says a voice behind me. 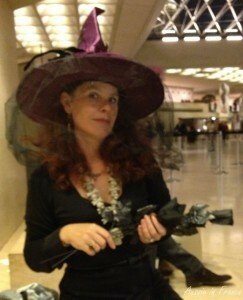 I turn to see Sylvia from Finding Noon in this stunning purple witch’s hat and skull necklace. We join Daisy de Plume, who’s running the show, at the meeting point and the other participants soon arrive. 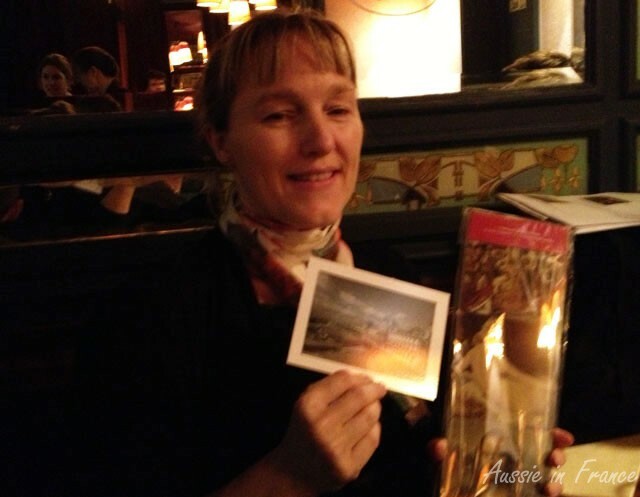 I am introduced to my team mates: Elodie from the Paris tourist office and Amanda and her 17-year-old son Eric. They’ve already done a hunt before, I’m pleased to hear, while Elodie and I are newcomers to the game. At 7 pm sharp, Daisy starts explaining the rules and we’re given our clue sheet. We have one and a half hours to find as many treasures as possible out of a total of 32. There are points for finding each treasure (10 to 80 depending on the difficulty) and bonus points buried in each explanation. Photographs of the team in front of the treasure will prove it has been found. Each member of the team of three to four people (there are seven teams tonight) is assigned a role. I’m the photographer (though sadly, my iPhone lets me down and a lot of the photos turn out a little blurred), Eric is the map-reader, Amanda the main clue reader and Elodie is the able assistant. In addition to taking photographs, I have to keep my eyes peeled for the treasures. 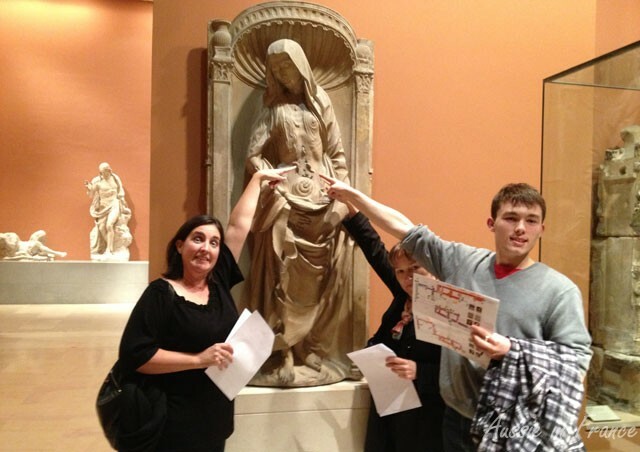 The first thing is to devise a search strategy by assigning each treasure to an area on the museum map highlighted by Daisy to indicate the sections of the Louvre involved in the hunt. It’s a very large museum so we don’t want to be rushing from one end to the other in just any old order, particularly as we’re not allowed to run or split up during the hunt. Pointing at the worms and looking very cheesy for the camera! Eric is champing at the bit, eager to find our first treasure. 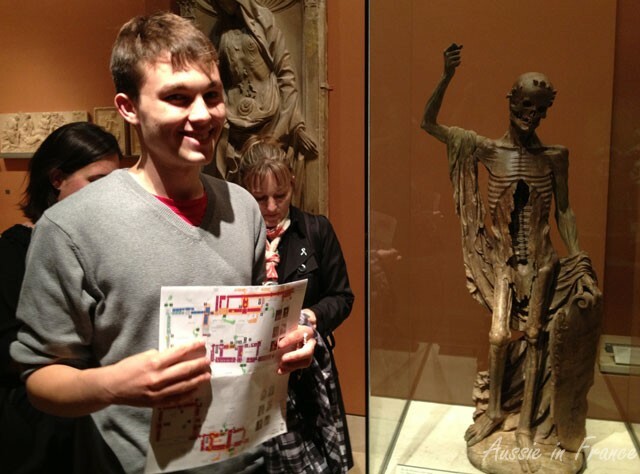 We start in the French mediaeval sculpture section with Death St Innocent* where team members are to be photographed pointing to worms. There are also bonus points for finding how many unicorns there are in the room. Amanda spies one on a bas relief. “Devious”, she says. The team is too busy concentrating on the next treasure to look at the camera! Once we have found all the treasures in one section, we move onto the next. 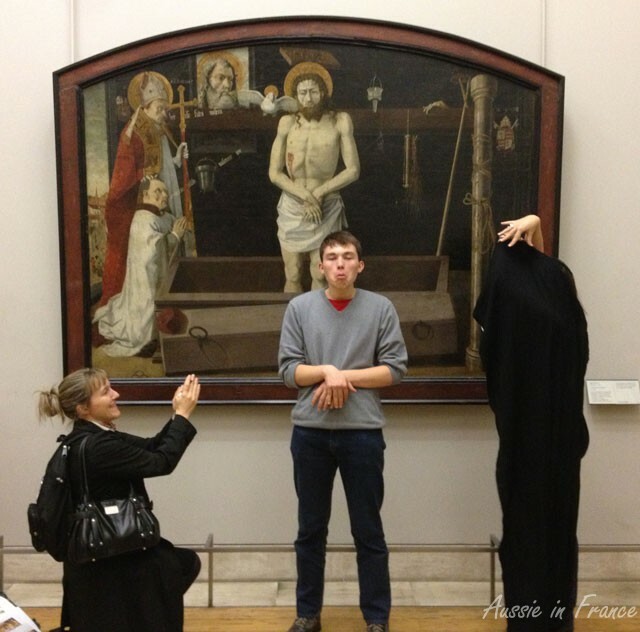 In front of a painting of Christ resurrected, we’re instructed to represent the hand positions of the figures behind us. Elodie cleverly winds a shawl around her in lieu of a wall. As time marches on, the pace picks up. One section turns out to be unexpectedly shut but thanks to Amanda’s determination, we find the treasure anyway. The team pauses in front of Ingres’ Grande Odalisque to win 10 bonus points by looking over their shoulders. Only once do we come across another team, towards the end of the hunt. Time is running out, we only have ten minutes to get back to the starting point or we’ll be docked two points for every one minute late! We haven’t found all the treasures but Daisy has already told us that it’s impossible to do so. As we hurry back, we make up a limerick** to go with the Raft of the Medusa – there’s a separate prize for the winning rhyme. We make it just in time. We sit down to tally up our points and catch our breath. Daisy was certainly right to tell us to wear comfortable shoes! The final tally – making sure we have all our points! Then we all head to L’Imprimerie for a drink and dinner. We’re given the answer sheet so we can tally up our bonus points. There’s an extra 50 points and a separate prize for inventing a team name***. We choose the Skeltering Skeletons. Everyone votes for a winner and WITCHLou, which I have to admit is better than ours, takes the prize. By the time our meal arrives, Daisy has finalised the scores. The Skeltering Skeletons win with 1150 points out of a total of 2000, more than 400 ahead of the runners-up. We all cheer and share our winning coasters of paintings in the Louvre. The other teams receive their prizes****. As it’s a little noisy, we can’t read out our limericks but they will be posted on THATLou’s blog so we can vote for the winner. We all agree we have had a wonderful time and seen parts of the Louvre and art works we would never have known about otherwise. Our attention to detail has been sharpened. I attribute our win to the excellent organisation and friendly cooperation of our team and the fact that we read some of Daisy’s posts beforehand. Having an enthusiastic teenager certainly helps as well! Elodie says she’s going back another day to find the other treasures on the list! I might just join her. 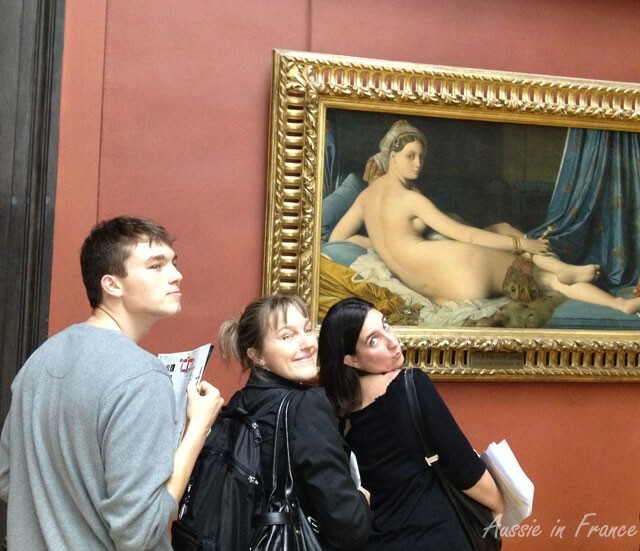 This entry was posted in Art, Paris, Sightseeing and tagged Thatlou, treasure hunt at the Louvre. Bookmark the permalink. Rosemary, what a GREAT write up – and how very resourceful you are to have re-created the hand in the Provençal resurrection! I do hope you and Elodie return for a visit, as that’s my whole goal of THATLou to get people to want to go back. Thank you, Daisy, the resourcefulness is all Elodie’s! I was mostly just the chronicler! Great post – looks like fun! Hope all’s well – and to see you in the new year. Thanks Carolyn – I had a great time. Let me know when you’re coming! This looked like it was so much fun! I would love to be involved in something like this when I come to Paris – and yes you would be more conscious of the art work another time! Well, you know where to go – just check out THATLou’s website. There are both public and private hunts. Hi Butcher Bird, Next time you’re in Paris just look us up if you’d like to go a-hunting. Aren’t Rosemary’s photos great? Looks like you had a fantastic time. I have friends that did a ThatLou visit to the Louvre last year, three mums with their daughters and they couldn’t stop talking about how great it was. Was thinking of you yesterday as we drove past Blois. Second time in as many months. I’ll have to stop in there on the next trip by. Yes, next time you go past Blois, let me know! Lovely to read that your friends enjoyed it so much. If you have anyone visiting at the end of November we’re going to have a Food + Wine THATLou on Sat 30 Nov (in honor of the American Thanksgiving).